Many patients are confused or concerned about dental crowns and bridges. We’ve outlined below some of the more common applications. If you’d like further information please don’t hesitate to contact us. A dental crown is a tooth-shaped cap that encases a tooth to restore the tooth to its original shape, size, and strength as well as to improve the overall appearance. 1. 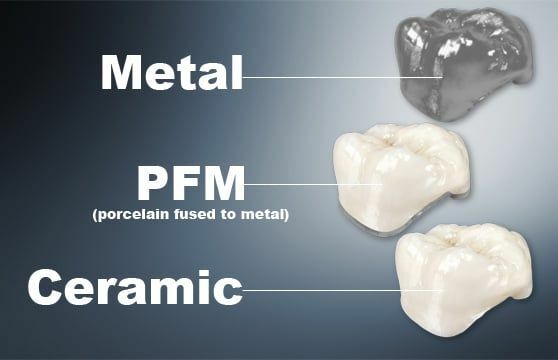 Porcelain-fused-to-metal dental crowns can be colour matched to your adjacent teeth (unlike the metallic crowns). A metal-ceramic (porcelain) crown is ideal for the back teeth, which bear the stresses during chewing and grinding. 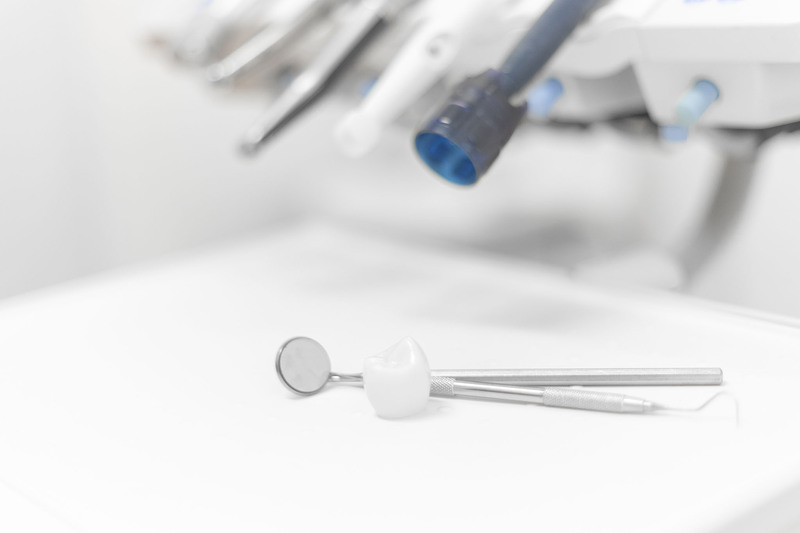 Designed with precision for perfect fit and function, all crowns at our practice are made from tissue friendly, biocompatible, wear resistant materials. 2. All-ceramic or all-porcelain dental crowns For the front teeth, which require that extra care in replacing the natural luster, shade and translucency to exactly replicate and improvise upon your smile, we offer the innovative Metal free or all ceramic crowns. Made from the highly resilient, tissue compatible Zirconia ceramic cores, through the modern Computer assisted (CAD CAM) technique, our all ceramic crowns are also an ideal option, if you prefer to keep your mouth metal- free or if you are allergic to metals. 3. Stainless steel crowns are prefabricated crowns that are used on permanent teeth primarily as a temporary measure. The crown protects the tooth or filling while a permanent crown is made from another material. In general, stainless steel crowns are used for children’s teeth because they don’t require multiple dental visits to put in place and so are more cost- effective than custom-made crowns and prophylactic dental care needed to protect a tooth without a crown.For children, a stainless steel crown is commonly used to fit over a primary tooth that’s been prepared to fit it. The crown covers the entire tooth and protects it from further decay. When the primary tooth comes out to make room for the permanent tooth, the crown comes out naturally with it. One or more missing teeth in the mouth can be restored to natural form, color and function with a Bridge or Fixed Partial Denture (FPD). A bridge is made up of two crowns for the teeth on either side of the gap — these two anchoring teeth are called abutment teeth — and a false tooth/teeth in between. These false teeth are called pontics and are made from highly resilient, tissue friendly metal-ceramic or zirconia all ceramic (porcelain). Dental bridges are supported by natural teeth or implants. They are designed to adequately distribute the biting, chewing or grinding forces and restore your teeth to their natural ability, form and appearance. The Crown and Bridge in the front teeth can replace one or more missing teeth with fixed replacements and restore your natural smile beautifully. You’ll find information on Crown and Bridgework in this article on our blog. 1. Traditional bridges involve creating a crown for the tooth or implant on either side of the missing tooth, with a pontic in between. Traditional bridges are the most common type of bridge and are made of either porcelain fused to metal or ceramics. 2. Cantilever bridges are used when there are adjacent teeth on only one side of the missing tooth or teeth. 3. Maryland bonded bridges (also called a resin-bonded bridge or a Maryland bridge) are made of plastic teeth and gums supported by a metal framework. Metal wings on each side of the bridge are bonded to your existing teeth.